Here you will find more free mosaic designs ideas and patterns. I separated the patterns into four groups. Each group represent an element of nature. Remember to bookmark this page as the selection of free mosaic patterns will grow with time, as I create more and make them available for you. 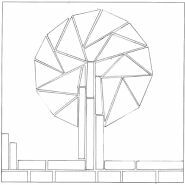 Each pattern is for an eight inch by eight inch mosaic, just click any image to get the detailed pattern. Need handmade unique ceramic mosaic tiles for your next project? I now have a shop section where I offer all types of handmade ceramic tiles, from ceramic circles, squares and oval tiles to ceramic animal, flowers and tree tiles. If you prefer making your own mosaic tile patterns, or you need help to replicate these patterns, just follow this very easy method. Sun pattern number 1, very easy to make, all shapes are identical. 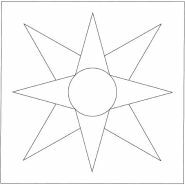 This is the sun pattern used in my compass rose with elements of nature. Sun pattern number 2, A little more difficult to make than number 1. 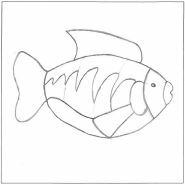 Fish pattern number 1. Use any color you want, but make the surrounding blue Fish pattern number 2. You can keep the same color within the dark outlines. Fish pattern number 3. 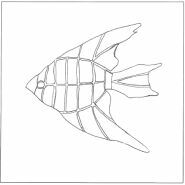 Fish pattern used in my compass rose with elements of nature. Tree pattern number 1. Use a brown for the trunk and a green for the leaves. Again make the surrounding blue. Use as many leaves as you want, they are all identical. Tree pattern number 2. For a more tropical look! You can use brown and green at the bottom to create a landscape. 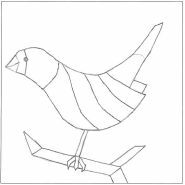 Bird pattern number 1. As with the fish use any color you want and make the surrounding blue. 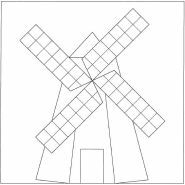 A windmill is a great representation of the wind! For the surrounding you can use blue, brow and green to create a background. 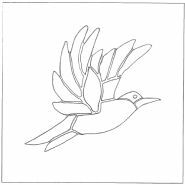 Bird pattern number 2. Bird pattern used in my compass rose with elements of nature. You do not like any of these free mosaic designs, here is a simple method of transforming your own images to patterns. First you need to find a picture of the pattern you want. A good place is a children's coloring book. These pictures are detailed enough, yet simple enough to reproduce as a mosaic. 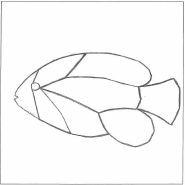 Then, once you have selected your image, outline the image lines with a large felt pen, these lines represent your grout lines. 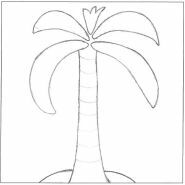 When you finished outlining the image, number each section and photocopy the image. Then cut out all the pieces making sure to leave out the felt line. 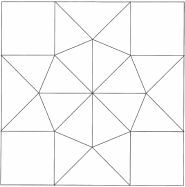 One piece of cut out paper represents one piece of tile. Transfer the cut out piece onto a piece of ceramic. Now gently cut each piece using your tile nippers. Smooth out the edges with a rough sanding paper or a table top grinder. Now make your mosaic using your preferred method. For this type of mosaic I use the double direct method with the photocopied image under my mosaic tile mesh. Once all your pieces are glued onto the mesh, your mosaic is ready to install!